Find the map, find the monoliths, avoid the dogs and survive to escape from the mazes! 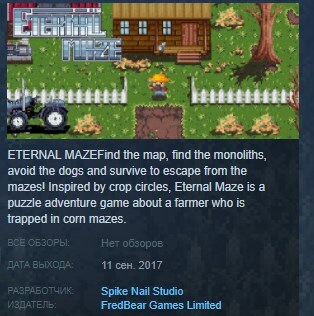 Inspired by crop circles, Eternal Maze is a puzzle adventure game about a farmer who is trapped in corn mazes. A leading investigator in the field of contacts with the alien civilisations, Dr Andrew Mystyngton found something in common among the people who have lived all around world in different times. Beacons, in the form of monoliths, found all over the Earth´s surface are used to send signal to the outer space. These monoliths have stopped working due to cataclysmic events in the past. The farmer will need to find an exit to escape. But Alas! It is not as easy as it looks. Players will need to solve riddles, navigate through the endless maze, avoid obstacles and ferocious dogs and use random items correctly to find the exit. Lead the poor old farmer to the exit so that he can be on his way to the next maze and be a little closer to getting out of the maze. Use available items and abilities in order to find your way out. However, there are also buried treasures in the map. Find, collect and dug them for extra scores and earning the corresponding achievement badge. Beware, though, there are creatures in the maze which will try to stop you from getting out of the maze. The creatures can be avoided and some will not attack immediately. But, if they get wary, there is only one thing left to do… RUN!! !